So, Kid Starfish loves wearing pajamas. For reals. We negotiate at least once a week about wearing pajamas out on errands. I decided some lightweight lounge pants couldn't be too hard to make and said I'd try a pair from cheap fabric for practice. Off to Joann Fabric we go and he picks out this obnoxious Captain America print. I balk. He wins. I didn't really use a pattern so I can't direct you to one. I used a pair of sweat pants that fit him and went from there. If anyone wants more info or (eep!) a tutorial, I can probably whip one up. So between these pants and Milo Doxie, I'm excited to sew for my Littles. Now what kind of nicer boyish fabric should I use for the next pair? I think he picked very well. He looks adorable! i really need to make some for my boy. he's getting a little old for the skin-tight two piece jammies. 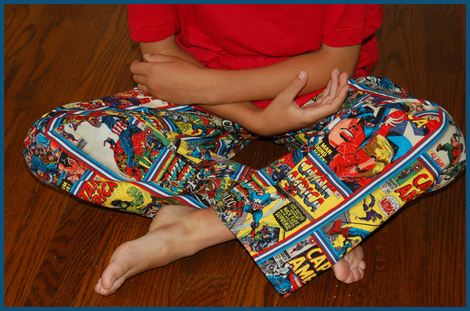 Girl, if you can make pj pants w/o a pattern, you have got talent in spades! "Go you" is right! Funny that I am reading this now. Tonight at guild meeting, I was talking to someone (gosh, I hope I learn names soon! 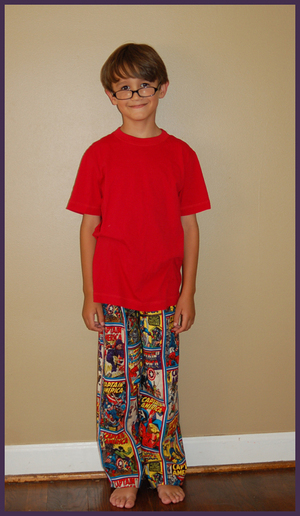 )about learning to sew and suggested trying pj pants. This page contains a single entry from the blog posted on June 28, 2012 7:21 PM. The previous post in this blog was Meet Milo Doxie!. The next post in this blog is Fresh Sewing Day.